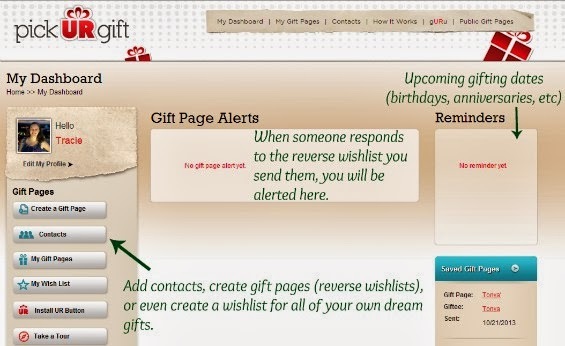 A couple of weeks ago, I told you how to use pickURgift.com to become a master gift-buyer by using reverse wishlists. It is simple and free. 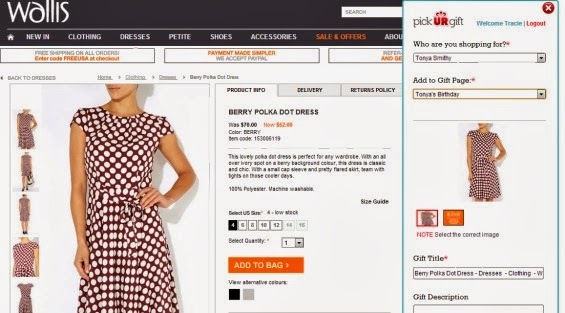 You add the UR button to your browser, and start creating wishlists. I'm going to create a reverse wishlist for my friend Tonya. I always have a hard time picking out the perfect gift for her. This is my pickURgift dashboard. From here I can add contacts, create gift pages (reverse wishlists), and be reminded of any upcoming birthdays, anniversaries, or special occasions for my contacts. I will also be alerted when someone responds to a wishlist I have sent. I add Tonya as a contact, and create a Gift Page for her birthday. Now I am ready to window shop. As I come across things I think Tonya would like, I click on the UR button. 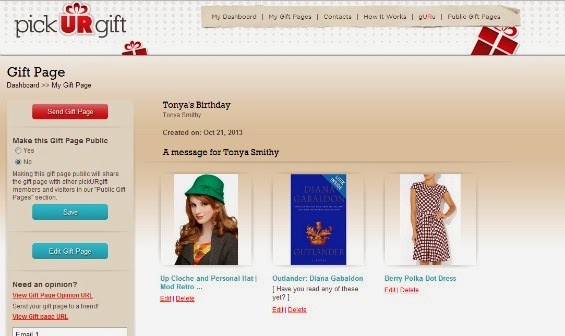 I choose Tonya's name from the drop down menu, and choose Tonya's Birthday under Add to Gift Page. I choose the appropriate picture, and can also add a note or description of the item. When I am ready to send the Reverse Wishlist to Tonya, I find it under My Gift Pages on my dashboard. You can see that I can easily edit or delete any items, and can also add a note or question to any of the items. I asked her if she has read any of the Outlander books, because I think she is somewhere in the middle of the series, but I'm not sure where. Once I am happy with my picks, I send it to her. She will receive an email with the link to her gift page where she will be able to leave comments telling me which items she loves and which ones are not her thing. I will buy her the perfect birthday gift, and everyone will be happy. PickURgift is more personal than a gift card, because your friends and family will see that you spent time "shopping" for them. They get to choose which gifts they would love the most, so you know for sure which gift will be a hit. For more information about how pickURgift.com makes your gift buying easier, check out my post on becoming a gift-buying master. Now, it is time for the giveaway! The creators of pickURgift.com are giving away a $200 Visa Gift Card to one of my readers. You can use it to get a jumpstart on your Christmas shopping, or for anything else that makes you happy. To Enter: Register at pickURgift.com with your name and email address - they will never ask you for credit card information because it is a free service. Create a Reverse Wishlist with 2-4 items on it. When you name your Reverse Wishlist, add FTG to the end of it so we can verify you created it for this giveaway (example: Tonya's Birthday FTG). That's it! Good luck. There are extra entries for following pickURgift.com on social media and sharing this giveaway. The giveaway will run until November 12, 2013 at 12am EST. -You must be a US resident with a US mailing address to enter. -Winner will be contacted by email. -Winner will have 48 hours to respond. Ack, I love this idea so much. I'm going to create a wishlist! we really believe that the Reverse Wishlist will improve your gift giving experience. Even if you do not send it to someone all of your gift ideas for that person will be stored and organized on your dashboard. I love the idea of using the Reverse Wishlist as a way to organize and store gift ideas. I love pickurgift! It's so much fun and super easy! You've gotta love things that make your life easier. Especially the closer we get to Christmas. Whew. I never got a Nintendo when I was a kid (my dad thought computers were much more important, and had gaming capabilities, rendering Nintendos useless). But I do remember being excited when my cousin got a Nintendo, because I got to spend a lot of time playing it with him. i received a small diamond pair of earrings, so pretty. That is sweet. Diamond earrings are always nice. I am going to date myself here....but I remember playing with the Evel Knievel stunt guy in the rain for hours growing up in Seattle one Christmas morning. I also received a Chia Pet once in my 20's. That one made me scratch my balding head. Maybe that was the message? Evel Knievel stunt guy?! That is an awesome gift! I had to laugh at your Chia Pet story. Too funny. I remember when I saw my first Chia Pet commercial when I was a kid, and I was convinced they were the most awesome, magical things ever created. The best gift I've ever gotten was for my 30th birthday, my fiance bought the entire Outlander series for me and surprised me. This means he REMEMBERED they were my favorite books, he found ALL 7 of them online, ordered them, and had them delivered without my finding out. HUGE KUDOS! That is a most awesome gift!! Your fiance rocks my face off. And he is very good at surprises. I once received a similar gift from a very special friend ;-) It was wonderful. I have gotten a lot of wonderful gifts in my lifetime, but I'm not sure any of them measure up to getting the Barbie Dreamhouse when I was 7. Barbie Dreamhouse!! How I LOVED my Barbie Dreamhouse when I was a kid. I spent hundreds of thousands of hours playing with it. Making Barbie go up and down the elevator over and over again. Amen. That is certainly something you can't buy in a store. Nice!! That is an awesome 21st birthday gift. I received an LG double oven range! That is SO VERY sweet!! I love it. Best gift I ever got was my first year anniversary from my parents, they paid for a 10 day trip for my husband and I, including a rented cabin, all food and even shopping money. Blew us away! One of the best gifts that I have ever received was a Keurig brewer. A custom made ring one of a kind pretty gemstone ring. I can wear it with anything and it's such a special piece. A pretty one of a kind ring that was custom made for me, it's very special to me! Best gift ever was a $200 Gould's Spa GC for Mother's Day. I had a blast picking out a massage, facial & a manicure. I think I got a haircut too. Great day! I gave birth to my son on Chanukah. It's hard to compete with that gift. My dog when I was younger. The backpack my wife got me from my alma mater and the team I was on. Love you sweetheart. The best gift I ever received was a really nice all-in-one computer. The best gift was my engagement ring on Christmas. I was given a kitten last Christmas, best gift ever! A friend made me a photo baby book of my twins - that was my favorite gift ever! A mother necklace from my husband. My best Christmas gift was a camera from my husband and kids. The best gift I ever received was a memory book, it was just so sentimental. The best gift I received was a spa day full of relaxation! My kitchenaid mixer that hubby got me a few years ago! love him! This sounds interesting. I'll have to try it. Best gift: An Alaskan Cruise. My engagement ring was my best gift! Tis the Season for PICKURGIFT! The best gift I ever received was the gift of time. From the time my daughter was diagnosed with a terminal brain tumor to her passing, we got 8.5 more years together. Nothing could ever trump that for me. Oh how I love this easy way to select gifts. Since I love to do as much of my shopping online as is possible, this will be so nice for me. My best gift ever? It was my engagement ring. I lost it a year and six days ago, but I still hope, by some miracle, that it may reappear one day. The best gift was something I would've never thought of getting. Something I would've never thought of getting. A sterling silver handmade snuggling foxes ring. The best gift was a ipad.